Christmas, for many, is the highlight of the year. Each year, the sense of anticipation comes earlier and earlier. It can be a time to get together with family and friends, to share food and exchange gifts. For children, this is a time of great wonder and joy. The most treasured memories of many adults come from the family Christmas experience of their own childhood. It is a moment of great significance for Christians as we come together in prayer to mark the birth of Jesus Christ. In preparing ourselves for this coming Christmas, we ought not to forget that this will be a difficult time for many individuals and families throughout the country as they try to deal with the impact of poverty, unemployment or the absence, once again, of loved ones due to emigration. As Christians, we are called to remember in a special way at this time the hope that is central to the Christmas story and to spread that message of hope in whatever way we can. And yet, despite that hope, the reality is that this will be a different Christmas. Over the past few years, our celebrations of Christmas have changed. Gifts and spending are for many the focus of the celebration. There is always a danger that this would become such a central part of Christmas that when resources become more scarce, there is little left! Nevertheless, thoughtful gifts and simple generous giving, within our means, however limited, are very much part of the Christmas experience. In the Gospel of St. Matthew (2-12) we read of the journey of the Magi to present their gifts to the baby Jesus. The real message of the Christmas celebration is that Jesus Christ, the Son of God, became one of us. God became man, and not as much man as child. The purpose of Christ’s coming was to lead us to God and win for us eternal life. The Birth of Christ is a powerful statement of our worth, made in the image and likeness of God and uniquely loved by Him. The real gift of Christmas is God’s gift of himself to us. That message can be forgotten. How many of us spend beyond our means in the Christmas period without stopping to think of the consequences, and then await the arrival of January’s bank statement or credit card bill with feelings of dread? Now, in a period of economic recession, we are acutely aware that this pattern is unsustainable, but the same pressures remain nonetheless, especially for parents. We know that as a society we need to change, but this will require each one of us to take action and show leadership in doing things differently. One of the emerging campaigns in recent weeks is the request that we would buy Irish goods. This seems an excellent way in which we can all contribute to supporting the Irish economy, providing and saving Irish jobs and, thereby, giving that hope which Christmas celebrates. Christmas should also be a time of prayer. We remember the Christmas message of the angels: ‘Glory to God in the highest and peace to all his people on earth’ [Luke 2:14]. We pray for peace in our country and in our world. We pray for all who are suffering at this time and we remember, in a particular way, all those who work to alleviate that suffering, following the example of Jesus. Our admiration and thanks at this time goes to all those who work and have worked tirelessly for others through the many Charitable organisations in Cork over the past year. Organisations such as the Society of St. Vincent de Paul, SHARE and the Simon Community amongst many others, make a real difference and are a living testimony to the meaning of Christmas – that we are made in God’s image and are precious to him. We pray too that the coming year will bear hope for a better future for our nation. There are still many challenges ahead, but if we commit ourselves at a personal level to put our gifts and talents at the service of all in society, each of us, alone and together, can make a difference and contribute to building a better future. To all the people of our Dioceses this Christmas, we wish you peace and happiness and we pray that the coming of Christ this year will fill your hearts once again with joy and hope. 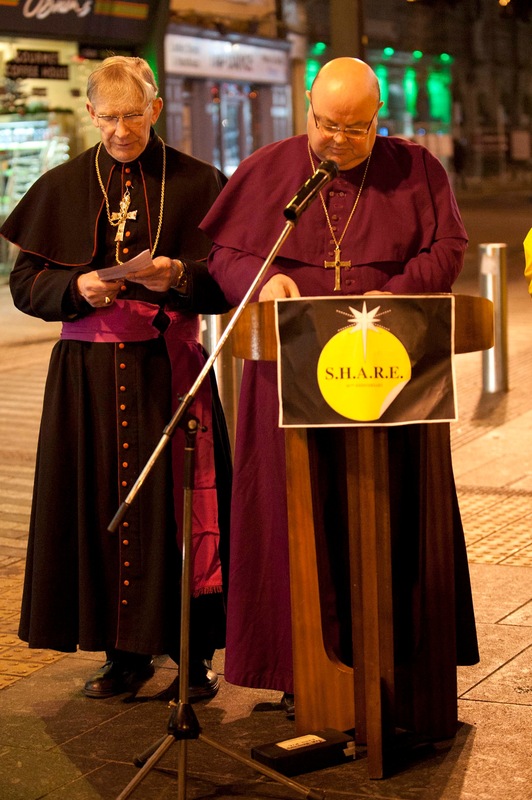 Bishop Buckley and Bishop Colton blessing the SHARE crib. This entry was posted in Bishop, Christmas, Diocese, News Release. Bookmark the permalink.